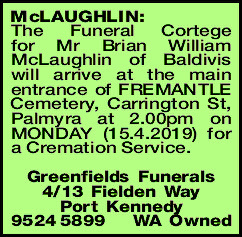 The Funeral Cortege for Mr Brian William McLaughlin of Baldivis will arrive at the main entrance of FREMANTLE Cemetery, Carrington St, Palmyra at 2.00pm on MONDAY (15.4.2019) for a Cremation Service. Never forgotten, always in our hearts. 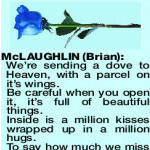 MCLAUGHLIN BRIAN We're sending a dove to Heaven, with a parcel on it's wings. Be careful when you open it, it's full of beautiful things. Inside is a million kisses wrapped up in a million hugs. To say how much we miss you and send you all our love. We hold you close within our hearts and here you shall remain. To walk with us throughout our lives, until we meet again. of an Uncle whose worth can never be told. 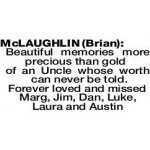 We are very sad for the passing of our dear friend Brian. Our deepest sympathy to our dear daughter-in-law Liz and son Anthony, Faye and families. 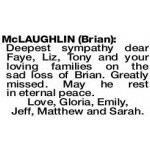 Deepest sympathy dear Faye, Liz, Tony and your loving families on the sad loss of Brian. Greatly missed. May he rest in eternal peace. Love, Gloria, Emily, Jeff, Matthew and Sarah. 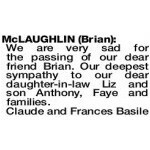 Deepest sympathy to Faye and family on the sad loss of Brian, we will miss him and especially his sense of humour. Doug, Barbara and Andrew.